Based on Netflix’s own published technical details, Rayburn says that its Content Delivery Network (CDN) partners Limelight Networks and Level 3 combined have delivered nearly 25 million GB of data. While 1.5 billion minutes of streaming content is “a huge number”, it still pales into insignificance compared to traditional DVD rentals. “If we use the numbers Netflix has on their website, they ship around 730 million DVDs a year. If we use an average of 120 minutes per DVD, Netflix ships roughly 88 billion minutes of video in the mail”, writes Rayburn. Nonetheless, these numbers demonstrate that the XBox 360 is by the far the most important set-top box or other Internet-connected device for Netflix’s Internet TV strategy (aside from the humble laptop, perhaps). “That really comes as no surprise considering that to date, Microsoft has sold nearly 14 million XBOX 360 consoles in the U.S., which is far more than the Roku, TiVo, Blu-ray players and broadband enabled TVs combined”, says Rayburn. It also explains why ‘Watch Instantly’ on XBox 360 remains a games console exclusive for Microsoft. 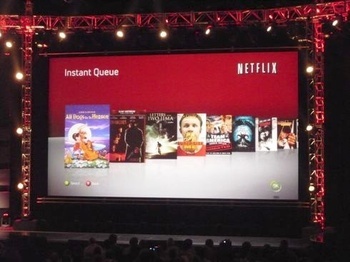 So don’t expect Netflix to team up with Sony’s PlayStation 3 or Ninendo’s Wii anytime soon. I think there may be a bit more to it than that, with the switch to Silverlight, and bits like streaming video previews to Windows Mobile, and wondering when HD streaming to the PC might be available. I’d really like to know more about this “exclusive” deal Netflix has with Microsoft to see who is making out better on the partnership. Rayburn’s comments about “not 1 million consoles may not be that relevant, I don’t really see a situation where someone would activate multiple netflix subs on one box, since each one requires an XBL Gold account it wouldn’t even be an efficient way to game a longer trial run out of the system. I don’t have an Xbox, but I do have a HD TiVo that works with Netflix Instant Watch. The combination of DVDs plus unlimited Netflix Instant watch are the reason I signed on with Netflix. Take either the DVDs or the Instant watch away, and I would cancel. By adding the Instant Watch for no extra charge to their DVDs plans made me a new Netflix customer. Also, Netflix on the HD Tivo is great. Can’t believe the image quality.